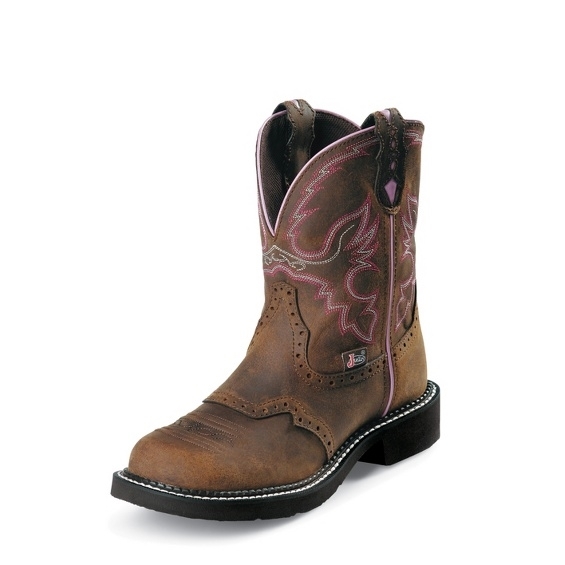 The Wanette Brown Steel Toe is an 8-inch tall Women's Justin Gypsy™ work boot that looks as good as it feels. Its built for a comfortable and relaxed fit with a rugged golden brown leather exterior decorated by a pink and white stitch pattern on the upper. This boot features a light pink seam on the quarters, trim on the collar, and peek-a-boo cutouts on the diamond cut pull straps. This boot also features a round steel toe for added protection and the J-Flex Flexible Comfort System® insole that cushions and supports the foot guaranteeing lasting comfort in or out of the saddle.